Seasons and times are remembered by events. The summer I learned to drive. The winter I started playing basketball. Junior year when I had my first girlfriend. With Labor Day in the mirror, it’s time to think what happening will mark the summer of 2015. A few years ago, I tried to teach BR how to ride a bike. It was a struggle from the beginning. He was uninterested. His constant refrain of, “Why do I need to do this” as I led him around the block was exasperating. BR was on the verge of riding, but he was never willing to fall. His fear held him back. While riding a bike is not a required skill for a happy childhood, I felt, somehow, that I failed him. Maybe I should have pushed harder. Maybe, I should have been more delicate. Maybe I should have been more understanding. Whatever the issue, the moment passed. It’s been two years since I even tried to get BR on a bike. SJ loves his scooter. He also loves his bike. He didn’t mind that it had training wheels. Ms. MMK and I tried telling him he was getting too old and big and that it was time to take the training wheels off. SJ was reluctant. He doesn’t like change. Finally, he agreed to try. His concurrence might have been simply to shut us up. Either way, Ms. MMK and I took it as an agreement. We got him a new bike (well, new to us. Thanks Craigslist. ), and it promptly found a home in the garage. For a few weeks, the only time the bike moved was when it got in the way of the lawnmower. I stalled. What if I failed him? What if I couldn’t teach him how to ride either? 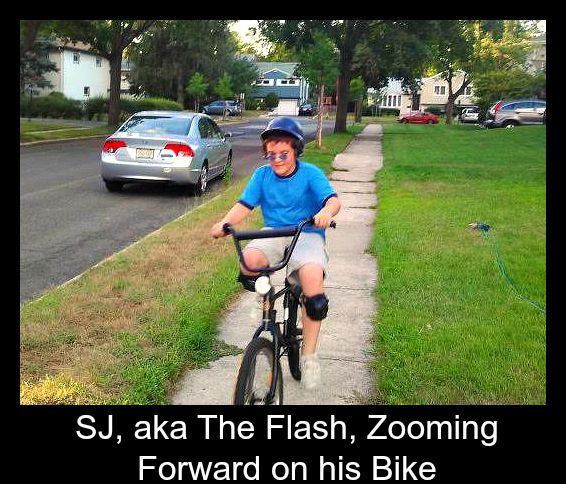 And, SJ wasn’t pushing for bike riding lessons. The sweat, whose ingredients were nerves and humidity, was dripping off both our faces. We started our journey: SJ was on the bike. I had one hand on his back and another on the bike. “Keep your head up. Keep pedaling, or the bike will stop. If you want to break, push the pedals backwards. Remember you’re steering, and the bike will go where you want it to go. And then the tears came, complete meltdown. Right in front of a neighbor’s house whom we are friendly with. “Why do I need to do this? I can’t do it.” SJ turned and started walking home. I took him by the arm. “No. We’re going around the block. You can do it.” He calmed and got back on the bike. The rest of the trip passed without adventure. When we got home, SJ threw the bike down and ran into the house crying. “That’s it. I’m not going around the block again. I hate this.”Ms. MMK heard him and saw his tears. “You did fine. Let’s put a band aid on and get back out there. You promised you would do two laps.” Arguments ensued. It was ugly. SJ and I ended up in his room. I told him the story of when I learned to ride a bike and made sure to mention I fell many times. SJ was softening but not ready to go back out. After letting him knock me down 25 times (which he enjoyed way too much), he was outside again. The second time around the block passed without incident. I let go a couple of times. SJ wobbled but stayed upright. He was making progress. We got back to our driveway. Sold. After a few tries, he did it. 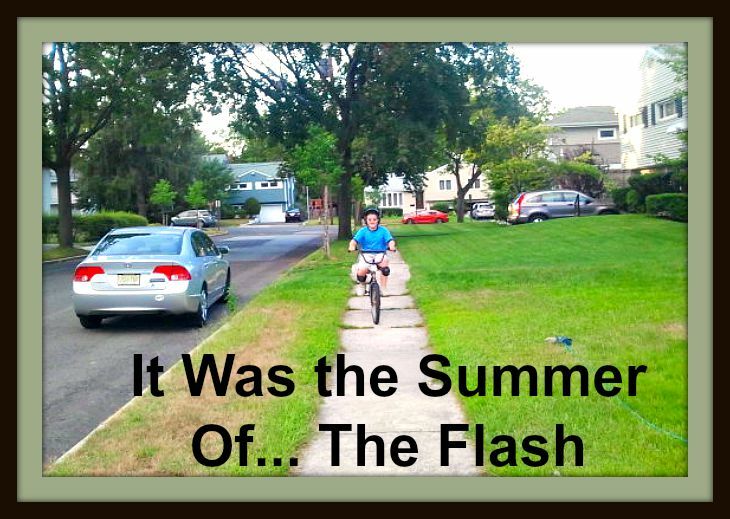 And it was the summer of SJ learning how to ride a bike. This entry was posted in Family and tagged bike riding, Children, parenting, Summer by lardavbern. Bookmark the permalink. Oh how wonderful! What a moment! I think it being the Summer of The Flash is spot on! Yeah, it was awesome. The smile – wow! You’re a parent – you know what I’m talking about. While they go together, the first part was more fun for me. Go figure. I was and am proud of him. Great story my friend, loved this one. Thanks bud. It felt good. Maybe one day BR will ride a bike. But either way, it’s his issue – not yours. You’re a good dad. He’s just not a bike-riding son.